Meteor showers usually happen when Earth crosses the path of comets, bodies of dirty ice that travel around the Sun in eccentric orbits. Then, small particles of ice and rock shed from a comet may enter Earth’s atmosphere at tens of thousands of miles per hour. Seventy five to 45 miles above the ground, these particles are heated rapidly to incandescence and disintegrate in Earth’s atmosphere, resulting in visible meteors. The Geminid Shower is a bit different from most meteor showers. 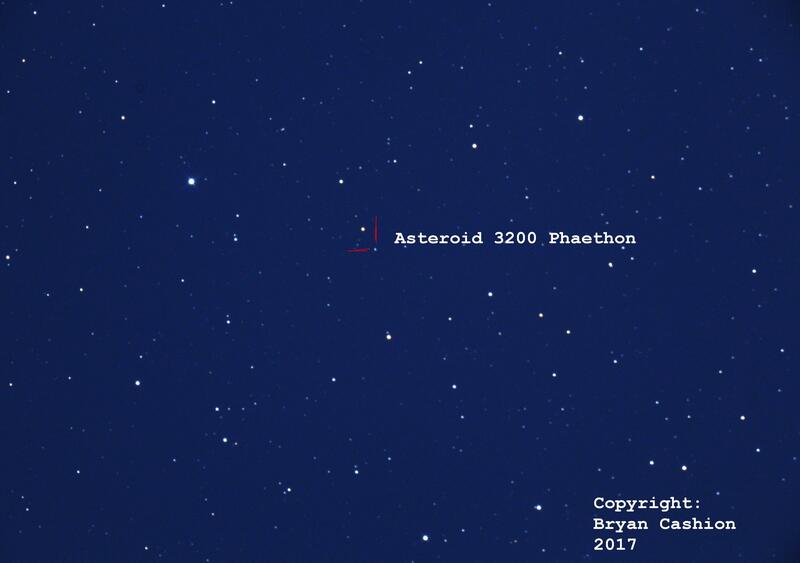 Its parent body is not a comet, but a rocky asteroid, called Phaethon. Unlike most asteroids, which orbit the Sun between Mars and Jupiter, Phaethon’s orbit extends from beyond Mars to inside the orbit of Mercury, coming to within 13 million miles of the Sun. When nearest the Sun, Phaethon reaches temperatures of 1400 degrees F and ejects a dust tail composed mostly of silicate minerals. Each year during mid December, Earth crosses Phaethon’s orbit, and particles that were ejected from Phaethon earlier plunge into our atmosphere, creating colorful meteors. Some of these can be very bright. The name “Geminid” refers to the meteors’ apparent origin point in the sky. This is in the constellation Gemini, an effect of our Earthly perspective on Phaethon’s orbit. This year’s Geminid Shower takes place under a waning crescent Moon, so even fainter meteors may be visible. From a dark place, look high in the sky, sometime between 8 p.m. and morning twilight. No optical aid is needed. If skies are clear, you may see up to 120 meteors per hour. The peak of the Shower is predicted for 12:30 a.m. on December 14, but meteors may be visible through much of the night in all parts of the sky. But remember - dress warmly!